Our Exclusive Christmas Eve Present to Adam Lambert Fans! You are here: Home / Adam in the Media / Our Exclusive Christmas Eve Present to Adam Lambert Fans! As I was catching up on some reading yesterday, I came across a little tidbit concerning Adam Lambert that I haven’t seen anywhere. I googled it and nothing came up. Isn’t that proof of an exclusive?! And one more time, here is that stunning performance! 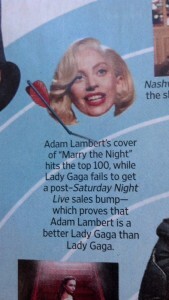 I’m not surprised – I liked Adam’s version of the song better than hers! I did see this snippet right after Adam’s Glee performance. Needless to say I was thrilled that he received some recognition for a job well done. Not long ago Nile Rogers commented that someday people will recognize what a talent Adam Lambert really is. Love his version better then hers. He makes all songs better. Adam DEFINITELY sang this song BETTER than Lady Gaga!! This is now my ring tone on my phone!!! He was ADAMAZING as usual!!!!! It would not be Christmas with out seeing my legend, ADAM. Fabulous! Now I’m hearing album chatter for 2014? That would be cool! by that performance. Thank you Adam for 4 years of joy. I just loved his version of Marry the Night. Something has to give for this talented guy. I am so hoping to meet a bunch of Glamberts at a Queen concert, see a new album from Adam and maybe more Glee appearances. I love this guy and he deserves to be huge. Anything Adam does is top notch…and “YES” I agree…I enjoyed his powerful rendition & spin of “Marry The Night”!!!! I love & respect Lady Gaga”s music & talent as well. Saying that…he killed this song and made me want to listen & watch the video over & over & over again which I did of course! More people need to recognize this mans AMAZING TALENT…& hoping one day (as per Nile’s Rogers comment) the masses will FINALLY figure out what they having been missing over these last couple years! Adam…CAN”T WAIT for some new music from you! Bring it on & make me want to “Listen to Music Again”! So excited! Happy New |Year to ALL GLAMBERTS! CHEERS!!! That was a great point of view. He was hilarious on performance and exquisite on his voice.